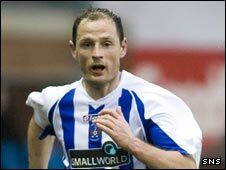 Kilmarnock will not be renewing the contracts of forward Allan Johnston or the defensive pair of David Lilley and Grant Murray. Former Scotland international Johnstone has reached the end of a two-year deal, while Lilley turned down the offer of a contract extension. Murray, 33, has also reached the end of a two-year deal. Meanwhile, captain Gary Locke is considering the offer of a coaching role at Rugby Park. Kilmarnock have also advanced other player contract negotiations for next season and have no plans to reduce the first-team squad budget in preparation for next season. The Ayrshire club increased their player budget over the past three seasons to £2m, but do not intend to increase expenditure on transfer fees, wages and agent costs.